The Germans pioneered the use of hydrogen peroxide as a rocket fuel in the early 1940s, powering the Me163 rocket fighter, and the V2’s turbine and fuel pump. British work was to take this much further. The key to a successful HTP motor is the choice of catalyst. When the HTP is passed over a suitable catalyst, it decomposes into steam and oxygen, and the decomposition is sufficiently energetic for the HTP to be used as a monopropellant. However, it is much more effective then to inject a fuel into the steam and oxygen. In British rocket motors this was always kerosene. The kerosene ignites spontaneously in the hot gases. 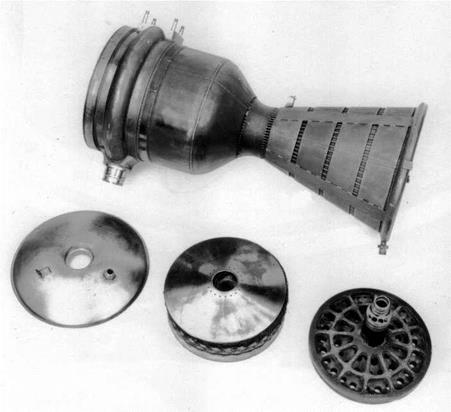 Silver plated nickel gauze was used as the catalyst, and such catalyst packs could be easily inserted into the rocket chamber. The ratio of HTP to kerosene was around 8 : 1. Although the combination does not give a very high S. I. compared with many other fuel combinations, it has other advantages. Not being cryogenic, it can be left in the vehicle and does not need topping up. Nor does it need insulation as liquid hydrogen does: the insulation adds to the vehicle weight. Further, HTP is quite dense, 1375 kg/m3, as opposed to 80 kg/m3 for liquid hydrogen. This makes for a very much smaller volume and thus smaller tanks, again saving on vehicle weight. 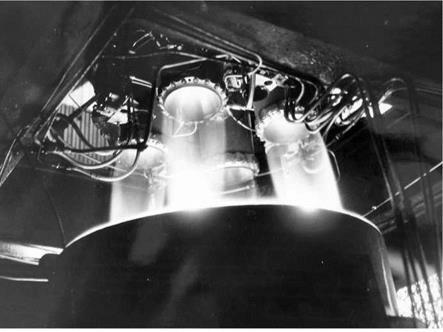 The later rockets developed by the UK using HTP technology were structurally very efficient. Other engines were then developed using this combination: Spectre, Sprite, Scorpion, Stentor and Gamma. These were initially for aircraft use, although Stentor would be used in the Blue Steel stand-off missile, and Gamma would go on to power Black Knight and Black Arrow. Most of these were developed by commercial firms: Scorpion by Napiers; Sprite and Spectre by de Havilland; Stentor and later Gammas by Armstrong Siddeley, as they were then. 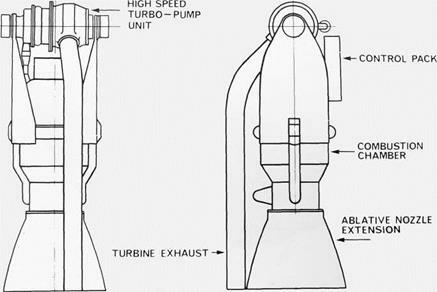 Sprite and Super Sprite were designed to assist the take-off of large aircraft such as the V bombers and the Comet, but the increase in effectiveness of the jet engine meant that these units were obsolete before entering service in any major fashion. Scorpion and Spectre were intended for aircraft, to augment the jet engine. However, the HTP combination was to represent the principal British contribution to the rocket field. The UK was to make hydrogen peroxide technology very much its own: no one before or since has made use of it on such a large scale. Early German and British work used compounds of manganese in one form or another to decompose the peroxide, often injected with the fuel, leading to a very messy exhaust. The secret lay in a metal gauze, through which the HTP was passed, and as it did so, decomposed to steam and oxygen at a temperature of around 500 °C. The gauze was made of silver coated nickel, and a catalyst pack was fitted at the top of the combustion chamber. Into these hot gases a fuel could be injected, and at that temperature they burned spontaneously, meaning there was no further ignition needed. This was very convenient, particularly in the rocket aircraft and the Blue Steel missile. The largest HTP motor produced was the large chamber in the Stentor motor for Blue Steel, seen above, which had a thrust of around 24,000 lb at sea level. Although the small chamber would find use in Black Knight and Black Arrow, the large chamber was not developed further. Figure 8. A later Gamma chamber, as used on Blue Steel, the later Black Knights, and Black Arrow. The ring at the top of the motor was where the HTP entered the motor, which was made of thin tubes formed to the shape of the chamber and brazed together. The catalyst pack is shown on the lower right. the aircraft lose control. Such an elaborate system, whereby the used motors would be jettisoned, parachuted back to the ground, then serviced for re-use, made very little sense. Figure 9. The Stentor motor developed for the Blue Steel stand-off missile. the second Canberra was grounded during the crash investigations. There was also a proposal to fit it to the English Electric Lightning, but the Lightning’s performance proved to be quite good enough without the rocket. Rocket assisted take-off and rocket interceptors very soon became obsolete; the main contribution of HTP motors was to Black Knight, Black Arrow and Blue Steel – and it is questionable whether HTP was the correct choice for Blue Steel. However, a new use was to be found for HTP motors – in ballistic rockets. The original Gamma 201 motor for Black Knight used four Gamma chambers, a double-walled chamber developed by RPE. This chamber was later replaced by the small chamber from the Stentor motor, which used the tube-walled construction. Equally importantly, the 301 allowed better adjustment of the kerosene/HTP mixture ratio, making the motor more efficient. The Stentor small chamber was carried over into Black Arrow, where the first stage motor, the Gamma 8, had, not surprisingly, eight chambers, arranged as four pairs. 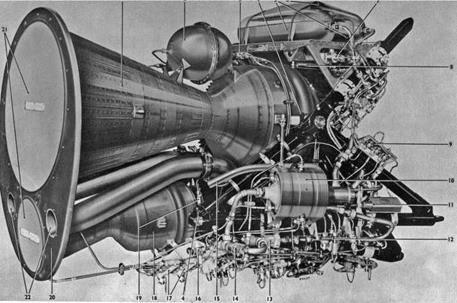 The second stage of Black Arrow was powered by the Gamma 2, which had two chambers, but with an extended expansion cone, as it would be operating in the near vacuum of altitude. This gave it a higher thrust than the first stage chambers. There is a final footnote to British HTP work. 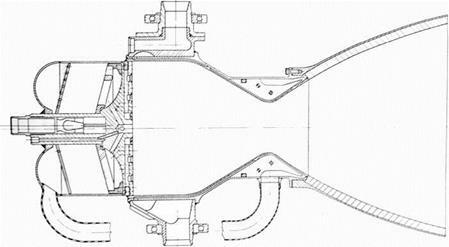 Bristol Siddeley (who became part of Rolls Royce in 1966) were given a contract by the Ministry of Aviation to develop a high performance HTP motor of 7,500 lb thrust, following on from suggestions made by the firm in 1963. The development programme ran from January 1964 to December 19664. The chamber was designed to run at much higher pressures than usual – 1,000 psi – and a total of 118 firings were achieved, totalling 78 minutes. The thrust level of 7,500 lb was chosen deliberately so that the chamber could be used as a direct replacement for the existing Gamma chamber. Unlike the existing Gamma chambers, the new chamber (named, for some inscrutable reason, Larch) was double-walled. The reason given for this was that ‘HTP tends to decompose on the hot surfaces in the cooling tubes, producing insoluble gases which can occupy an unacceptable proportion of the restricted passage of one or more of the tubes and lead to burnout’. Figure 10. A Gamma 201 motor for Black Knight being test fired at the Armstrong Siddeley test site, Ansty. The new chamber (Figure 11), would also have been slightly lighter. Replacing the existing Gamma chamber in Black Arrow with the new improved version meant that the vehicle could be stretched. As a consequence, the payload could be increased from 232 lb in polar orbit to 375 lb. Despite the time and money that had been spent on the development, it was not taken further. When RAE did decide to uprate Black Arrow, it went for the solid fuel strap-on booster option. The Gamma motors of Black Arrow were to be the last HTP motors to be developed, but HTP motors did put Britain’s only satellite into orbit, and it is fitting that a British developed technology was used to do so. Figure 11. The experimental high pressure ‘Larch’ chamber. Figure 12. ‘The Larch’ HTP/kerosine test chamber.